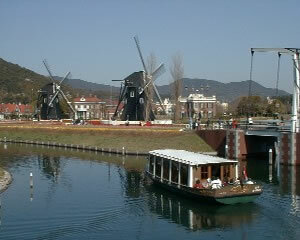 Huis Ten Bosch is a Dutch name, is it a place ... if so what's it doing in Japan? 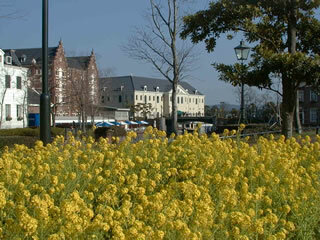 We were very lucky to find Huis Ten Bosch marina. 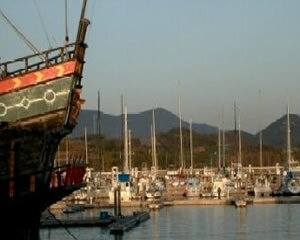 It is a part of the small boat harbour that forms the central focus for a Dutch theme park near Sasebo, Nagasaki on the west coast of Kyushu. The park was built by Dutch and Japanese engineers to commemorate the Dutch presence in the area of over 400 years. The first Dutch sailors arrived in the vessel "de-Liefde" and in 1660 all signs of Christianity were routed, the resident Portugese despatched and Japan was closed to all outsiders. Trading and contact with the outside world was restricted to a few Dutch merchants confined to the very small island of Dejima in Nagasaki Harbour. A causeway to the island was opened weekly and Japanese and Dutch exchanges were made with the understanding that it was strictly commercial, an arrangement that suited both parties. This continued until 1860 when Admiral Perry from the US forced the Japanese to trade with gunship diplomacy. The marina is of the best quality we've ever seen and we were allowed access to the park. A sound and laser light show at the harbour entertained us nightly and a train station nearby gave us access to the shops and sights of Sasebo and Nagasaki. HTB marina lies on the shore of a large lake, Omura Wan which is 20nm across and accessible to the ocean so short cruises were easy too. We would have liked to stay for years!